Design will be done in vinyl. Choose from Glitter (does NOT rub off), Hologram or Foil. Lettering is permanent. Lettering done in your choice of colors. 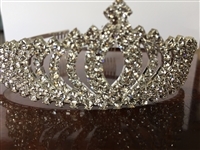 Fun crystal tiara to wear at your celebration! 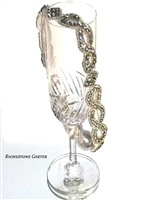 The garter is personalized with the classic 3 initial monogram of the bride and groom's last name initial in the center flanked by the first name initial of the bride and groom. 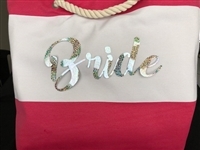 The Monogram is made of sparkling glitter (commercial glitter that does NOT rub off) or Shiny hologram lettering and comes in an array of colors. Also available is a Brilliant Rhinestones and Beads applique that can be added for an additional charge. A matching hair veil with the same rhinestone applique is also available. This is a sure way to Sparkle during your pre or post wedding festivities. Please provide the 3 initials and your desired size and color of lettering. Generally the garter is worn on the right leg about 3' to 6" above the knee but it's up to you. Please use a flexible tape measure and measure the width of your leg (where you want to wear it). If you don't have a flexible tape measure then use a string and measure that against a ruler. Pls. give me that exact measurement. Stunning Czech Rhinestones and Sparkling Beads applique adorn this beautiful satin garter for your Wedding, Bachelorette Party or Boudoir Photo Shoot. A sure way to Sparkle during your pre and post wedding festivities. Great gift idea for that special Bride To Be! Stunning Czech Rhinestones and Sparkling Beads surround this beautiful garter for your Wedding, Bachelorette Party or Boudoir Photo Shoot. This bridal garter is made of dozens of sparkling rhinestones and beads. There is a small piece of light soft elastic in the back to allow for easy on and off.